Although he is not an art historian, Jerry Langley has made significant contributions to the history of African American art by conducting research and writing seminal articles on accomplished but overlooked artists. 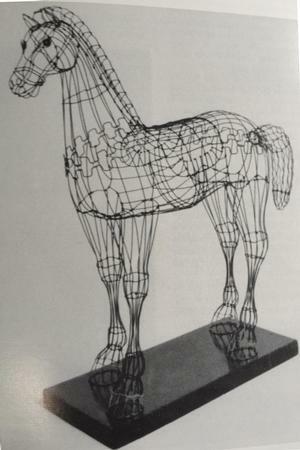 His training and experience as an attorney, he discovered, carried over into art historiography. Searching public records, digging in archives, interviewing informants and the other detective work that he did for articles on under-recognized artists was comparable to the investigative work that he did as an attorney. He also found that his training in constructing a legal argument was applicable to organizing and writing coherent articles on art for publication. Langley earned a J.D. in law at Columbia University. 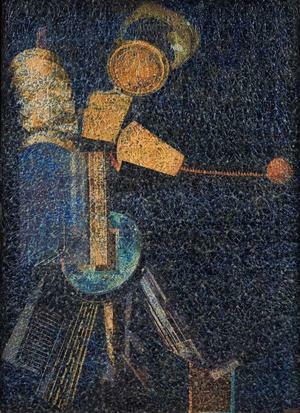 During his career as a FDIC attorney in Washington, DC, he began collecting art, astutely selecting of works by master artists that fit his budget. He has been a contributing writer to the IRAAA since 1998 when he was co-editor of the Comprehensive Guide to African American Art, a special issue of the journal. Since then, he has contributed articles to the IRAAA that have illuminated the lives of works of important African American artists who were sinking into obscurity. The following article is the first in a series about his work as an art detective and biographer. I enjoy writing about little-known artists. The research has taken me to many places, introduced me to many people, and led to the discovery of interesting primary materials. During the pursuit, I’ve often encountered dead-ends. But I’m not discouraged because, like a gambler, I always figure that my luck will change and, in the end, I’ll be able to establish a greater public record for a talented artist who generally has been overlooked. In my research, I usually begin by looking at publications on African American artists and contacting art historians, artists and knowledgeable fellow art collectors for information. Then I examine key public resources such as the Smithsonian Institution Archives on American Art, the Library of Congress, local newspapers, genealogy sources, US census reports, the Social Security website, the Schomberg Center for Research in Black Culture, and the Howard University Moorland-Spingarn Research Center. General searches on the web also have resulted in helpful bits of information. I’ve learned that even small details can provide significant leads. Before the advent of the smart phone, I always took a high resolution camera, tape recorder, and pen and pad to fully capture the information and artwork discovered. The articles go through many drafts as I try to ensure the information is presented accurately and in the most appropriate tone. In addition, I have found that working with an editor has help me to tell stories, not just compile reports. I usually send copies of the published article to contacts at the places where I’ve done research, to interviewees and others who have provided significant assistance. Sometimes I also give my notes, clippings, photos and other data of archival value to the appropriate research institutions. 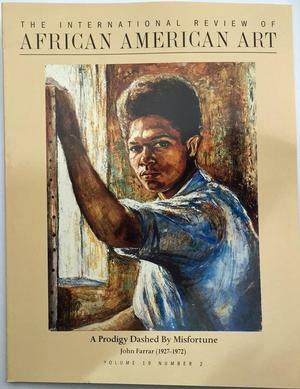 All of the articles were published in the print International Review of African American Art (IRAAA) with the exception of the Fred Jones article which was published here in the online IRAAA+ webzine. All but one of the artists were deceased when the articles were developed. 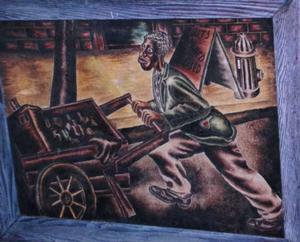 The living artist was Hayward Oubre who was 85 at the time and leading a somewhat reclusive life in Winston-Salem, NC. 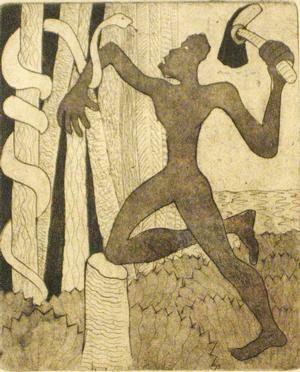 Discovering the Artist: I came across Oubre while searching for works by Elizabeth Catlett for my collection and was impressed enough to want to learn more about him. Not much information was available in the general publications on African American artists but I gleaned that he was considered to be very talented. 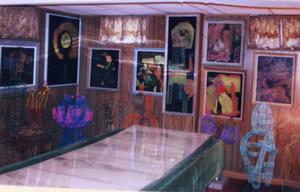 As luck would have it, I mentioned him to artist Sam Gilliam who gave me my first big lead. Gilliam had compiled information on the artist that he shared with me and referred me to the Winston-Salem State University Archives which was compiling material on the artist. 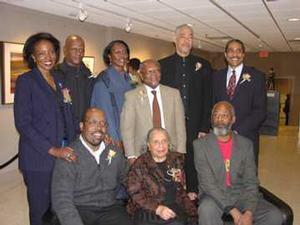 The WSSU archivist helped me arrange to interview the artist. Main Challenge: The most challenging experience in the development of the article involved the artist himself. 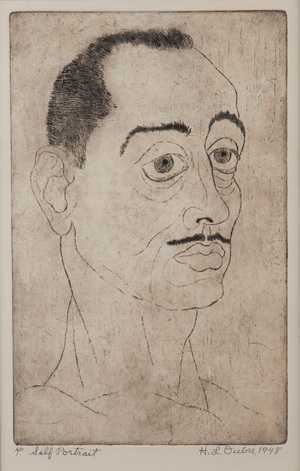 He was an angry man, bitter about the way he had been ignored and treated over the years as a talented black artist. Consequently, he had established a reputation as being very blunt, confrontational, and extremely difficult to deal with. My experience with him tended to bear this out. A Reluctant Interviewee: He was not thrilled about the prospect of being interviewed and clearly conveyed that at the outset when I telephoned him, noting that he had had his fill of reporters who interviewed him and "didn't get it right." Ultimately, I think he conceded to me because I was a black writer and the article would be published in an art journal of a noted Historically Black University. I also sensed that he was still looking for over-due, public recognition. Nevertheless, he assured me that this would be his last interview if it didn't work out right. Alerts From My Contacts: As I prepared for the interview, I received a stream of comments from those who knew him or knew of him wishing me "good luck" on attempting to interview a very difficult man. And, a couple of them apprised me that one newspaper reporter had left his home in tears after an interview attempt. However, all attested to the fact that he was a fine artist. The Onsite Greeting: After driving more than 300 miles the day before to meet with him, my first face-to-face contact with the man occurred as I was approaching his house for the interview. He gave me a short, cordial greeting and then proceeded to chastise me for parking on the street rather than in his driveway, stating that in North Carolina it was permissible to park in a person's driveway and that was where I should have parked. I made no effort to argue the point. The Interview: As we entered his home and settled down in his living room for the interview, he pointed to an array of his works in various media surrounding us and then proceeded to talk at length about it, his art career and life experiences. Whenever I tried to interject questions to structure the flow of the interview, he ignored the questions and kept on going, noting at one point that "you didn't come all the way here to hear yourself talk." When I sought clarification or to get more details on matters he was presenting in a fast pace, he would state "I have already covered that," "you are not listening to me," or "you must be suffering from Alzheimer's." On other efforts to raise questions, he would sometimes answer the question with a question (the Socratic Method employed in law schools) to lead me to the answer. He was intent on telling his story his way. So I just let the tape recorder roll on. Why the Anger? : Throughout his many emotional outbursts, it was clear that he felt deeply slighted and mistreated by the art world because his contributions to the visual arts had gone largely overlooked. He was angry at the white art world because he said they wanted him to do "primitive" art which he refused to do and they chose to ignore him. 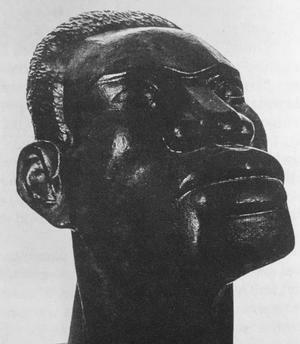 He was angry at African American writers and art historians because he said that they were aware of his talent, but blackballed him because he refused to confine his artwork to reflect African and African American culture and concerns. These two things weighed heavily on him and he constantly asserted: "I won't let nobody control me!" Very Intelligent and Witty Though Combative: Though he was often challenging throughout the interview and when we spoke by phone, it did not appear that he sought to do it in a mean- spirited way. Generally, he just seemed to be frustrated that he couldn't get his day in the sun, and he vented that frustration frequently and in different ways. Often after harsh remarks during the interview, he would smile and explain that he was not angry at me. Nevertheless, I was certain on some occasions that his remarks were made to see if I could be easily intimidated as he told his story, but I generally held my ground. For example, on one occasion while we were standing and discussing some matter [I don't recall what], he unexpectedly got nose-to-nose with me and asked in a calm, but unsettling manner, what would I do if he hit me. After assuring him that I had learned well how to defend myself in the army, he smiled and moved on with the discussion of his art and life story. Despite that hard veneer he generally projected, I found him to be a very intelligent person, who could be very insightful, witty and even charming at times. And, during one of our lengthy phone conversations that usually took about an hour with him doing most of the talking, he readily confessed that he was "the most difficult person [he] ever met." The Final Draft & Publication: Given the tenor of the artist's anger and his concern that nobody could "get it right" about him, I sought to quote him frequently in the final draft so that his story could be presented his way as much as possible and the reader could get a real sense of the man. In the end, I was not certain that he would be happy with the article. Moreover, he was very displeased when I declined to let him review the article before publication. So, I delayed calling him after sending him a published copy because I didn't know what to expect based on my prior experiences. When I did finally phone him a couple of weeks later, I was indeed surprised to find that he was elated. He stated that it was a "beautiful," 'masterful, "great" job, but he did note accurately two errors in the published text: that he taught at Florida A & M from 1948 to 1949 (not just in 1949); and that the award that he received from the North Carolina Governor after he retired was "The Order of the Long Leaf Pine" (not The Order of the "Oak" Leaf Pine). As a token of appreciation, he subsequently sent me a couple of his prints (Entanglement and Silent Sentinel) with a hand written note stating in part: "You are a damn good writer and I think I am a damn good artist." Thank you for taking the time to look into my contribution to the art world. Moreover, for having the guts to write a powerful article about your findings! Both the whites and Blacks who tried to overlook my record should ask themselves how did they think they could get away with it! You are a damn good writer and I think I am a damn good artist! While it was quite a challenge to develop this article, it was a real treat and honor to have had the opportunity to meet and write about such a talented artist and dedicated art educator! I hope his artwork will continue to get more exposure so that the public can get a full appreciation of the range of his artistic achievements. 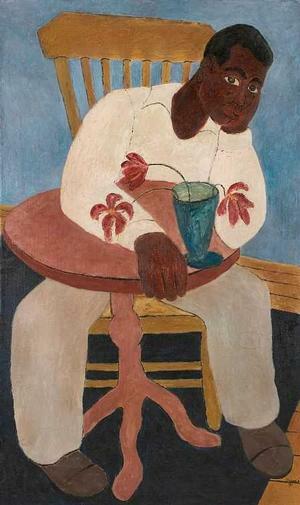 The article, "Overlooked, But Unbowed: Hayward L. Oubre" was published in the International Review of African American Art, v. 17, no. 4, 200l. 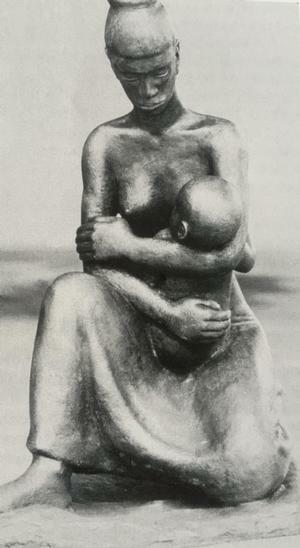 And copies of the article and/or materials collected during the research were provided to the David C. Driskell Center, the Smithsonian Institution's Archives of American of Art, and Oubre's family and patrons. I spoke about the experience of interviewing Oubre at a March 23, 2003 program held by Clark-Atlanta University Art Gallery in connection with their exhibition of his artwork. During the spring of 2015, Tyler Fine Art Gallery in St. Louis presented a retrospective exhibition and sale of Oubre's artwork. 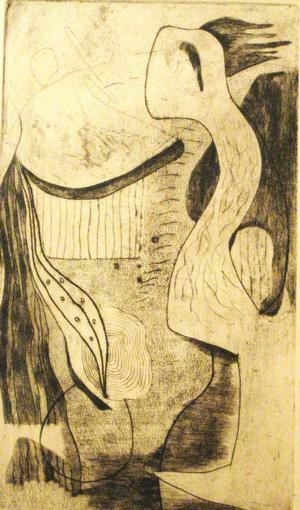 The exhibition catalogue and single images of his works can be viewed here. Jerry Langley lives in the metro Washington, DC area of Annandale VA.
With the exception of Lunar Robot, all of the images shown here were in the "Overlooked, But Unbowed: Hayward L. Oubre" article in the print IRAAA. The article also contained images not shown here. 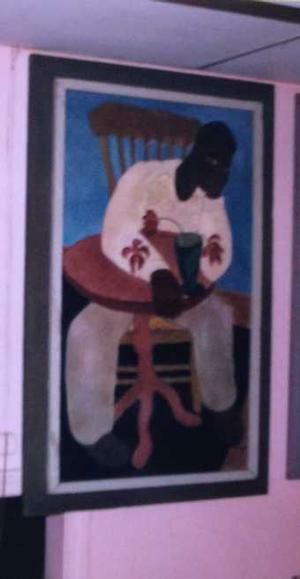 Reproductions of all art are courtesy of the Hayward Oubre estate.